sIf you are in need of implants or new fixed teeth, take a little time to read the following information and check out our site. Dentistry has achieved a level of excellence in recent years and is a shining example of cultural innovation and technology for other branches of medicine. Thanks to constant innovation in the field of paradontology, we are able to rebuild gums and bone that have been lost over time. These regenerative techniques are now performed in a mini-invasive manner and are sustainable. Successful treatment is not measured in the short term but over a period of years. It is “Regeneration” rather than “ Substitution” that makes the difference. What are the problems faced by many patients? Many patients have lost bone and gums due to trauma and infection and have been forced to abandon the idea of fixed teeth as a result. 1) ) Exploit any remaining residual bone ( eg. by using short implants). This is a relatively quick and simple procedure. A deficiency of bone and gum, where possible, may be compensated by using longer teeth or sections of artificial, pink gum. This solution permits the positioning of implants of adequate length in an IDEAL position ensuring that the shape is as aesthetically pleasing and as easy to keep clean as possible. The choice between the two options is based on patient health, age and aesthetic and functional requirements. What are the advantages of bone regeneration? Thanks to GBR guided bone regeneration, modern dentistry is able to treat bone loss efficiently. GBR is a dental technique which reconstructs bone that has been lost over time and matches the original anatomical conditions of the patient. 1) IMPROVED AESTHETICS where tissue reconstruction allows the positioning of fixed teeth of the correct length and shape. 2) IMPROVED HYGIENE, a harmonious relationship enables self-cleaning of residual food thanks to actions of the tongue, lips and cheeks and hygiene at home is much simpler. 3) LONGER LASTING. There are currently no scientific studies which determine the ideal length of an implant. However, even in unfortunate cases of bone loss due to peri-implantitis, a standard length implant is more reliable than a short implant. *Peri-implantitis is a condition characterised by progressive bone loss around the relative implants and inflammation of the surrounding gums. 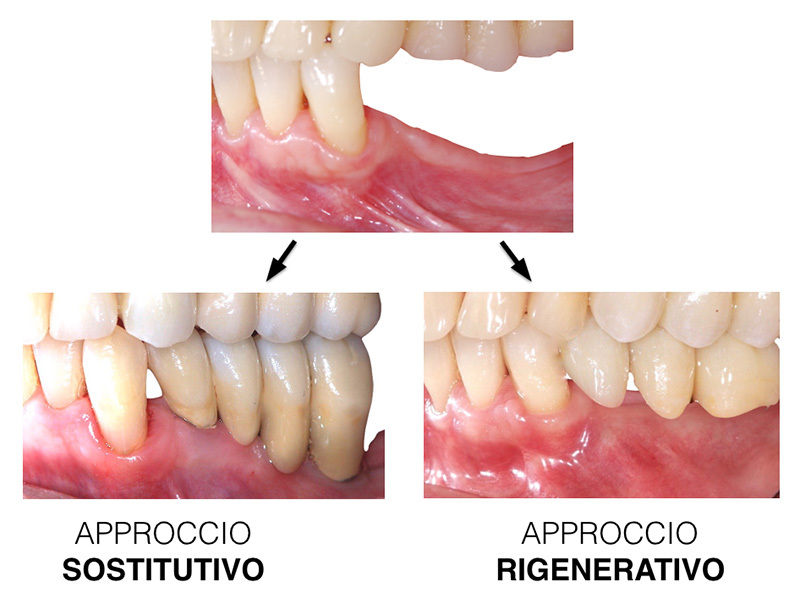 The choice of REGENERATIVE or SUBSTITUTIVE treatment must be considered carefully with your dentist and varies according to patient health, age and functional, aesthetic requirements. GBR is used when bone tissue is reabsorbed. The procedure involves positioning the bone graft under the gum. 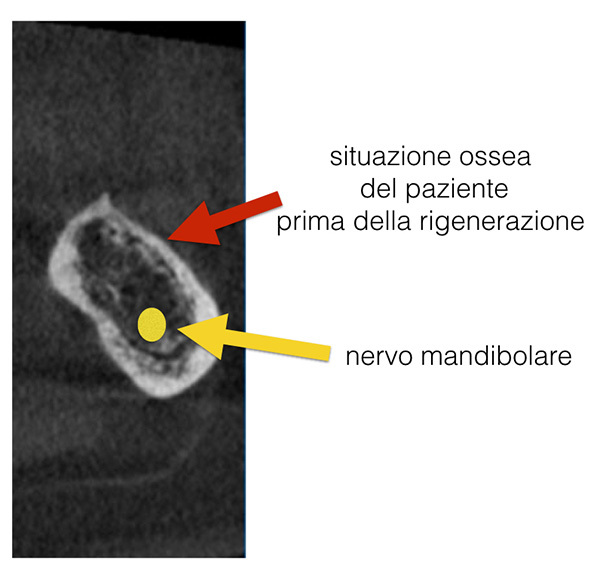 The graft is then stabilised with a “barrier”. The bone particles can be surgically extracted from the patient and/or biomaterials made from synthetic bone or animal bone (bovine, porcine, equine). The use of biomaterials simplifies and makes the procedure much quicker and swelling and post-operative problems are greatly improved. 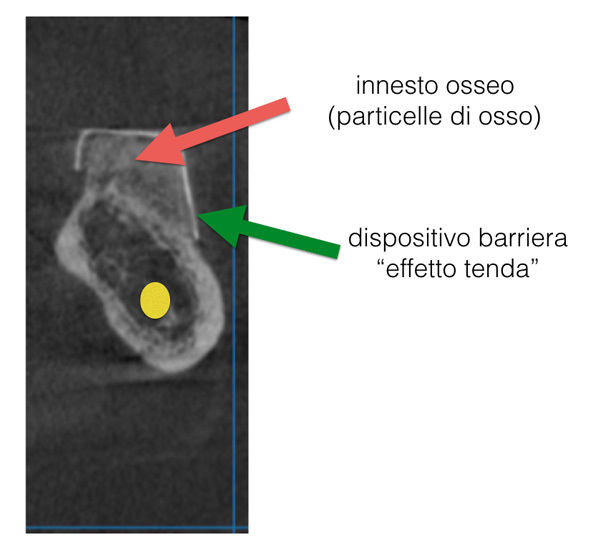 The “barrier” protects and immobilises the bone graft and creates the so-called “tent effect” and enables the creation of new bone in just a few months which varies according to the type and initial bone defect. Titanium implants are inserted and create new artificial roots to anchor the teeth to. The dentist can evaluate if it is possible to carry out both steps (bone regeneration and implant insertion) in the same session. the procedure can be carried out under local anaesthetic in the dental studio without the need for hospitalisation. currently available biomaterials substitute bone reduce post-operative swelling and pain. quicker treatment times as in certain cases both a) bone regeneration and b) implant insertion can be carried out during the same treatment session. How can bone re-absorption be prevented? “ALVEOLAR PRESERVATION”, a technique where substitute bone biomaterials are inserted into the extraction area and are stabilised and protected with a specific barrier device. REGENPLATE® is an innovative technique which uses grade 2 Titanium Plates as “barrier device” for Bone Regeneration; this a ductile material and is highly biocompatible, it is also currently used for the construction of cardiac pacemakers.